To leave a swanky legal practice in the United States to return to Philippines to steer the family business wasn’t an overnight decision for the Chairman of one of the largest Filipino-owned pharmaceutical companies in Philippines. Pascual Total Health Group's Martin Pascual took up the “intimidating responsibility” to address his sense of belonging to where he was born and help to grow a legacy that was more than just his individual ambitions and goals. The 44-year old CEO believes it is his duty and responsibility to the family to scale the business so that it provides support and resources to many people. He is deeply attracted to Philippines because of its people. “People value relationships more than anything else. 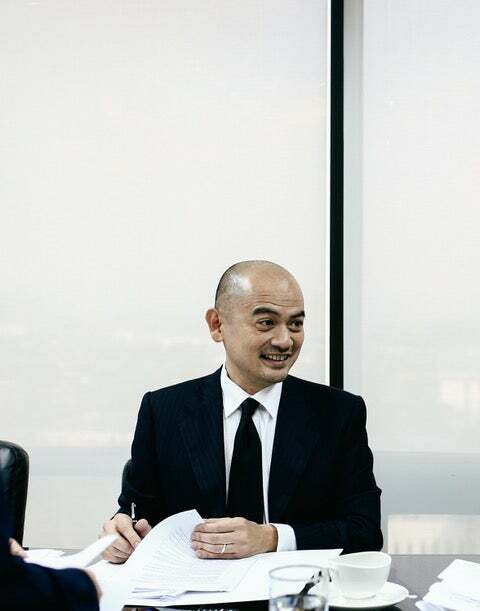 While there are positive indicators about the business environment in the Philippines and the growing economy, the most important thing are the relationships that set the tone and foundation for everything else,” says Pascual. Pascual recalls coming of age in India where he became an adult and cultivated his entrepreneurial mindset. “It was where I explored and experimented, where I cultivated my entrepreneurial mindset through tasting new foods, meeting new people and being open to different customs. It was where I learned about different perspectives and different opinions. Life in India was such an overwhelming experience that I returned home full of inspiration,” says Pascual. Not many know Pascual spent some time at Mother Teresa’s “Home for the Dying (Nirmal Hriday),” in Calcutta, India and it changed his life. The experience gave him life tools, the confidence to handle risk and uncertainty and most importantly exposed him to a radically different culture and way of life and taught him that in the midst of chaos and difference, one can find purpose and a sense of meaning in relationships. “Relationships unite even the most ostensibly disparate cultures and environments. Relationships connect people. Relationships can transcend language, culture, upbringing, and other limiting factors. As such, whenever I felt unsure or demoralised later in my life, I would think back to being 20 years old and living all alone in Calcutta, and I remember the secrets that I learned there. It gave me an inner strength and wisdom that I don’t think I would have found that early in my life,” recalls Pascual. While Africa was where his idealism was tempered and where he developed as a professional and learnt about the sobering realities of economic development, namely, that economic development is not all about good intentions and solving poverty. It was also about ambition and expanding influence. Carrying forward the legacy of his grandparents Isosceles and Leonora Pascual was inspired by three learnings Pascual got from them. Relationships are Everything: First, they always treated people like family meaning they had a lot of compassion and patience for the employees. They cared about the employees and lent money, provided resources and support. They valued the relationships with people and treasured loyalty. It led to a very generous and supportive company culture. Working to Build for Generations: Second, they were committed to the business in a way that is now sometimes at odds with millennial technology entrepreneurs who start and build businesses with the principal goal to sell them later once it reaches a certain size. My grandparents looked at building something for generations. They saw the business as an instrument that could help people including the families of employees and their own extended family. They intended to grow it in order to build something for later generations and there was a sense of stewardship toward the business. Investment of Time: While my grandparents did consider selling the business at some points, it was never a primary objective. Now, it seems as though businesses are there solely to provide a vehicle for a sale and it becomes a commodity that is simply one part of someone’s portfolio of companies or investments. As founders, my grandparents oftentimes spent more time on building the business to the exclusion of all else, including their children. It gave their children an example of commitment and responsibility. Third, because my grandparents cared deeply about the business, they spent all their time on it. Like a special child, they spent a disproportionate amount of time on the business often to the exclusion of everything else. They knew and paid attention to everything about the business in a way that not many professional managers do. All discussion around meals centered on the business the exclusion of hobbies, extracurriculars, etc. Pascual says he simply wants to make his grandparents and parents proud, to build upon something that helps people and to work for something that is bigger than him. But no business is built without challenges. Pascual details 3 main challenges in building a family business. Employees: First challenge is making difficult decisions regarding employees. Many times in order to grow and professionalize the business, you have to replace people or let go of people who have been with the business for a long time, sometimes for several generations but who can no longer grow with the business. This is a natural part of growing a business but it is how we manage this transition process that reflects our compassion and empathy as a family company. Communication: Second challenge is cultivating healthy communication among the family members relevant to their different roles as owners, employees, directors, or siblings and cousins and across generations. Naturally, we bring our family histories into our communications and sometimes it leads to fraught moments and sensitive conversations. To keep communications healthy is an intentional act and requires a collaborative effort supported by activities that encourage supportive dynamic family engagement. Different Views: Third challenge is working with family and the complex dynamics of those relationships. Each family member approaches the business with different expectations, perspectives and assumptions. It is aligning those differences with a larger vision and goal. The business should unite rather than divide, encourage rather than exclude, nurture rather than regress. The business must balance the values and traditions of the past while introducing new ideas and an entrepreneurial energy and urgency that lays the seeds for future growth. Pascual is a member of the Young President’s Organisation and says knowing that you are responsible for and accountable to other people, whether family, employees or the communities where we are present makes him a responsible CEO.